You pick up your children at Vacation Bible School and you can't wait to hear about their day. But instead of sharing what they've learned, they're tired, or hungry, or just reticent about their day. Or maybe they are overflowing with fun details! Either way, here's how you can be intentional when it comes to talking with your kids about each day's VBS lessons. With all of the other summer activities you have going on, it can be easy to forget to ask your children important questions about their time at VBS. By choosing a specific time to chat, you will be better equipped to stick to the same time-slot the remainder of VBS. If they're excited to share about their day, opting for a chat in the car allows at least a few minutes or more of attention to your questions. Plus, their experience is fresh in mind, making car-time an ideal time. However, if they're tired, ask just one or two questions and circle back later, such as dinnertime when the day’s fun and learning can be given more reflection time while everyone is engaging in the meal together. Bathtime and bedtime may be good options for you, though, if the days tend to be busy ones. Wrapping up the day with a chat about your children’s day gives them a chance to process what they've learned and gives you the opportunity to reflect with them. Ask your child questions like, “What story did you learn about today?” and “What did you enjoy learning about most?” Direct and detailed questions are more likely to evoke direct and specific responses. Or, try to express your interest into a statement like this one: "I would really enjoy hearing what songs you learned today." Showing you care about the fun things your children learned at VBS might just make them really want to show you. After all, you are their biggest fan! One more specific talking point to try is based on a simple suggestion such as, "Let's say the take-home point of the day together!" Be sure to look at the handouts your kids bring home. These include take-home points for parents so you’re in the know about what they learned that day. When kids are fully engaged in something fun and even challenging, learning-connections are being made. Doing an activity with your child further connects you to what they’ve been up to at VBS, all while strengthening their awareness of the day’s lessons. Here are a handful of simply ways to further connect with your kids over VBS. We hope that you and your children will have some great interactions this VBS season. 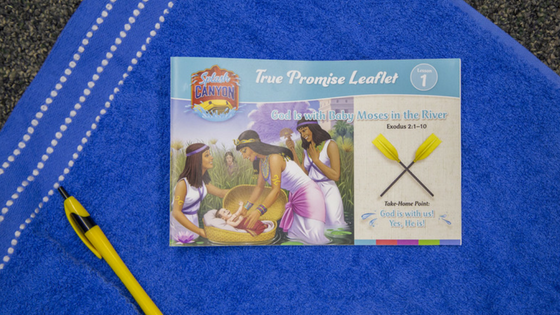 Visit the Splash Canyon website for more insights into what they’ll be learning in VBS!